SAN FRANCISCO (KGO) -- SFO officials say a suspicious item that prompted the closure of Terminal 2 Sunday has been cleared. Officials say TSA security screeners found a toy hand grenade inside a passenger's bag around 12:30 p.m. at a checkpoint and thought it looked suspicious, so the bomb squad was dispatched. #SFOAlert The suspicious item in T2 has been cleared and the T2 security checkpoint is re-opening. 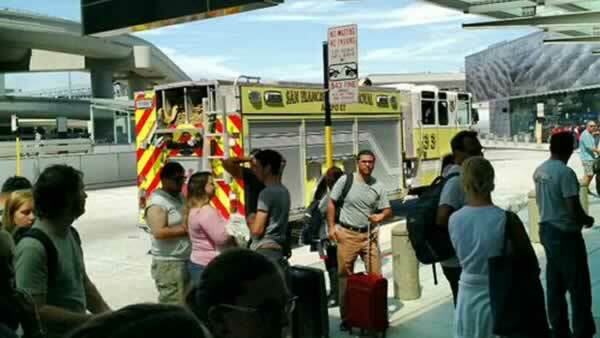 Officials cleared the suspicious item and reopened the terminal shortly after 2 p.m. The man who owns the bag is being questioned. Passengers who were flying out of Terminal 2 had been told to screen at Terminal 1, which was causing major delays. #SFOAlert T2 passengers are being rerouted to boarding area C which connects to T2 via a connecting walkway. #SFOAlert SFPD is clearing a suspicious item at the T2 security checkpoint .